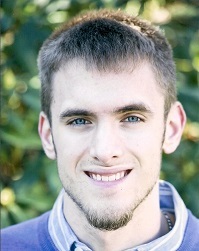 Save a call to the Plumber and fix your toilet tonight. Unscrew the nut that connects the water supply line to the bottom of the tank. Reach inside the tank with a long-handled screwdriver to hold the bolts while you loosen the nuts underneath with a wrench. Lift the tank from the bowl, then lift the bowl free of the floor. 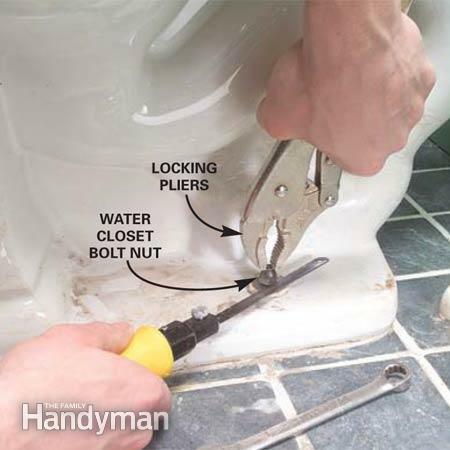 Unscrew the water closet nut with a wrench. If the bolt spins along with the nut, grab the exposed bolt above the nut with locking pliers. Loosen the nut just enough to squeeze in a hacksaw blade below the nut and saw through the bolt. TIP: Use a close-quarters hacksaw like the one shown or wrap a rag around a bare blade. Before pulling the stool, shut off the water supply valve and remove the water line leading to the tank (photo 2). after flushing the toilet, look in the tank and listen for water. If it's still running, you'll have to shut off the water main and replace the valve. Then sponge out the excess and take off the toilet. Scrape off all old wax with a putty knife and clean old caulk and debris. To determine what to do next, check if you have a broken flange (photo to the right) or a flange that's more than 1/4-in below the finished floor (next step). Rot may also be around the flange (following step). If nothing appears to be wrong, just adding the new wax ring may fix it (last step). 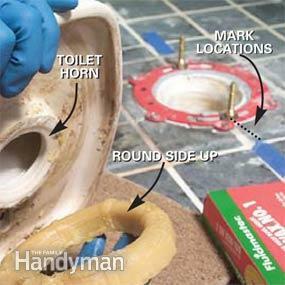 Lay a bead of silicone caulk around the perimeter of the toilet flange. Thoroughly clean off wax residue with mineral spirits. Set a reinforcement ring over the flange so the water closet bolt slots line up and mark screw locations on the floor. 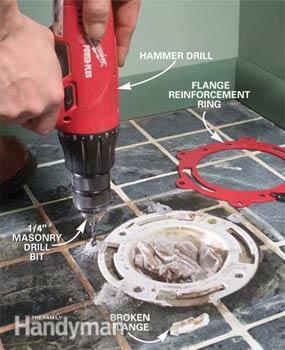 Drill a clearance hole through tile or masonry with a hammer drill and a 1/4-in. masonry bit. Stop when you reach the subfloor. Old cast iron and plastic commonly break, caused by rocking or overtightening. Look for a cracked rim on the outside of the bolt slots. If it's broken, install a reinforcement ring with six 1.5-in No.8 oval-head stainless steel screws. If the flange is concrete, use 1-1/4 inch flathead concrete screws and masonry drill bit. Line up the holes of the extender ring with the flange holes and screw both parts into the floor with No. 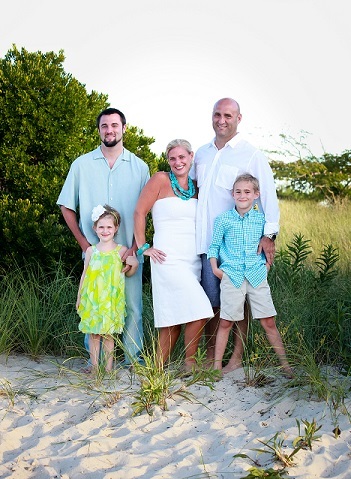 8 x 1-1/4 in. stainless steel screws. 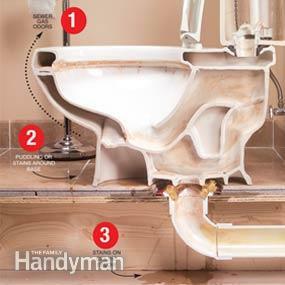 Wipe away excess caulk and reset the toilet (Photos 11 – 14). Clean the toilet flange with mineral spirits to remove all the excess wax. Fit the extender ring over the flange and remove any original flange screws that line up with the ones in the extender ring. Apply a bead of silicone caulk around the inside edge of the extender ring. 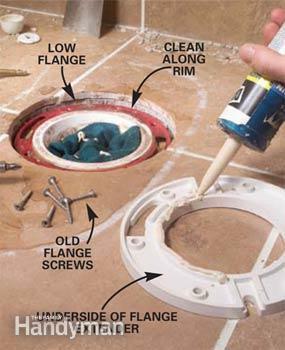 Remove the old toilet flange screws and slip each half of the flange support beneath the flange edges. Lift the flange with a screwdriver or pry bar if necessary. Anchor the flange support to the subfloor and then drill 1/8-in. pilot holes through the support in the four holes closest to the flange bolt slots. Run additional screws through the flange into the support and reset the toilet. A leaky flange can cause rot. Remove the old flange and inspect the damage. If it's small and contained, you can buy a support bracket to transfer the load past the subfloor, otherwise you'll have to cut out the rot. and replace the damaged framing/subfloor/finished floor. A common cause for a leaky toilet is because the wax ring lost it's seal. That could be because the toilet rocks when you sit on it. 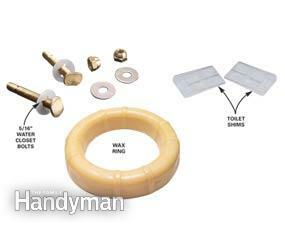 Reset the toilet, using shims if the floor is uneven, and replace the wax ring if it's broken. Finish by caulking around the toilet. 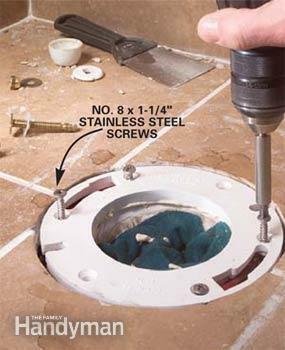 Slip the bolt cap washers over the bolts, then snug down the water closet washers and nuts with a wrench. Be careful not to overtighten the nuts, especially over gaps between the toilet and the floor. 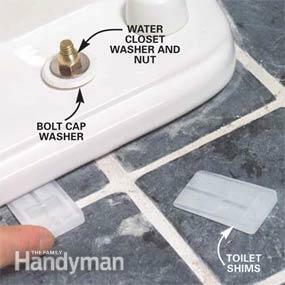 Slip toilet shims under any toilet edge gaps and cut off the excess length. Some shims are pretty tough. If a utility knife won't cut through the plastic, you may have to chop them off with a sharp wood chisel. Align the bolt holes with the masking tape and lower the toilet bowl straight over the bolts. Push down on the rim of the toilet to seat the wax ring, then close the lid and sit on the toilet for a few minutes to force the toilet all the way to the floor. Stop when the porcelain surface rests on the finished floor. Push the new wax ring onto the toilet horn with the rounded side toward the toilet. Mark the water closet bolt positions on the floor with masking tape.